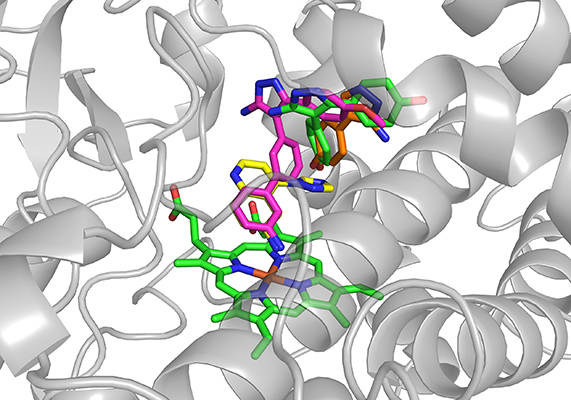 We are using fragment-based approaches to understand of the role of cytochrome P450 enzymes (CYPs) from Mycobacterium tuberculosis. CYPs are mon-oxygenases responsible for a range of oxidative modifications. M. tuberculosis has a relatively high number of CYPs, some of which are essential, and some of which are of unknown function. Our interests are two fold, to develop isoform specific inhibitors as chemical tools (and potential therapeutic leads) and also to try and identify the substrates of the orphan CYPs. This research is a collaboration with Professor Andrew Munro and Professor David Leys at the University of Manchester. Application of fragment screening and merging to the discovery of inhibitors of the Mycobacterium tuberculosis cytochrome P450 CYP121.